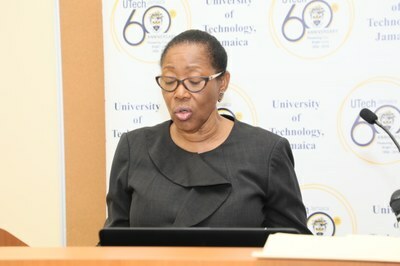 60th Anniversary Lecture Highlights Link between Pioneer, Dennis Johnson and the Jamaican ‘Sprint Factory’ — UTech, Ja. 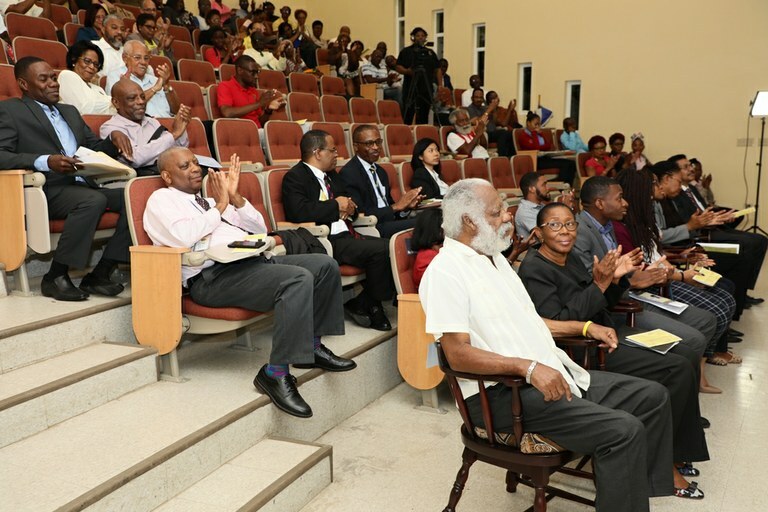 An appreciative audience applauds Professor Colin Gyles, Deputy President, University of Technology, Jamaica during his UTech, Jamaica 60th Anniversary Distinguished Public Lecture. 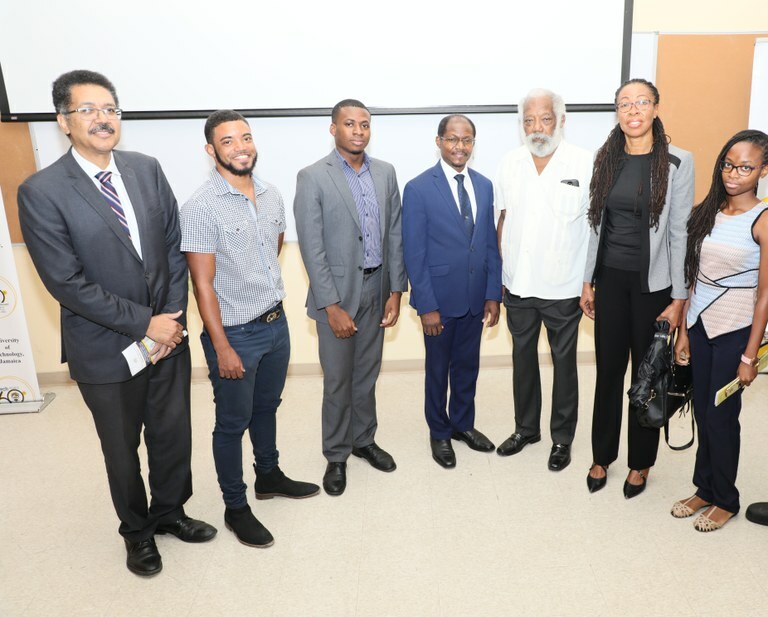 Professor spoke on the topic, “Dennis Johnson, UTech, Jamaica and the Jamaican Sprint Factory” held on March 7, 2019 at the Shared Facilities Building, Papine Campus. Mrs. Blackwood also advised on behalf of Minister Grange, that the National Sport Museum which she noted will “proudly display and acknowledge this great son of Jamaica,” is in an advanced stage of being established. Professor Gyles was introduced by Dr. Kamilah Hylton, Dean, Faculty of Science and Sport. The Vote of Thanks was ably moved by Mrs. Nodley Wright, Executive Assistant, FOSS. 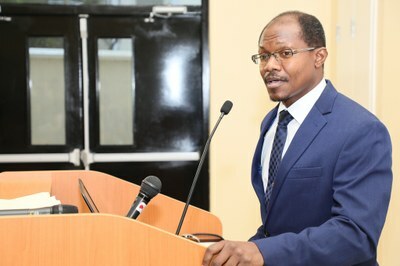 Mr. Dennis Johnson who arrived to welcoming applause from the large gathering of members of faculty, staff, students and members of the sports fraternity, was on hand to respond to questions and recommendations which ensued in a robust question and answer session following the lecture. 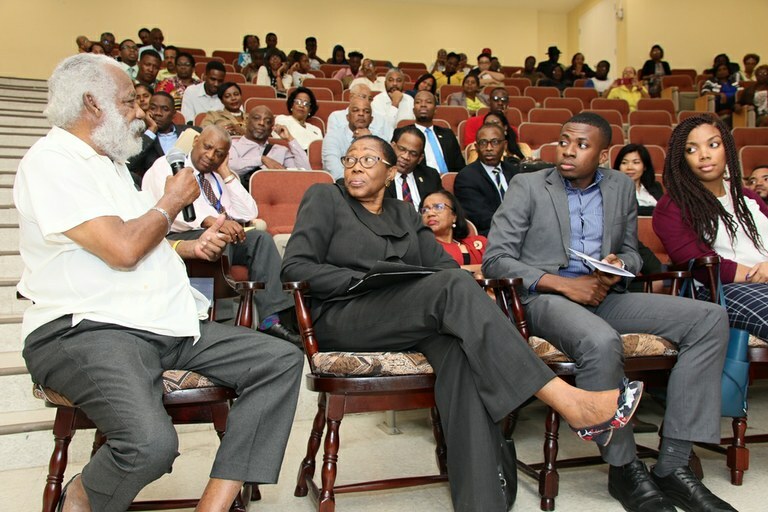 Mr. Dennis Johnson (left) responds to questions during the Question and Answer session at the Distinguished Public Lecture. Family: Professor Colin Gyles (centre), Deputy President, University of Technology, Jamaica and Mr. Dennis Johnson (3rd left) pose with President, Professor Vasciannie (left), and members of their respective families (from left), Mr. Peter Johnson, son, Dennis Johnson, Mr. Daniel Gyles, son, Professor Gyles, Mrs. Marlene Pottinger-Gyles, wife and Miss Kristen Gyles, daughter.